I've had a lull in posting as I am developing some more reporting on my data site to support future blog posts. 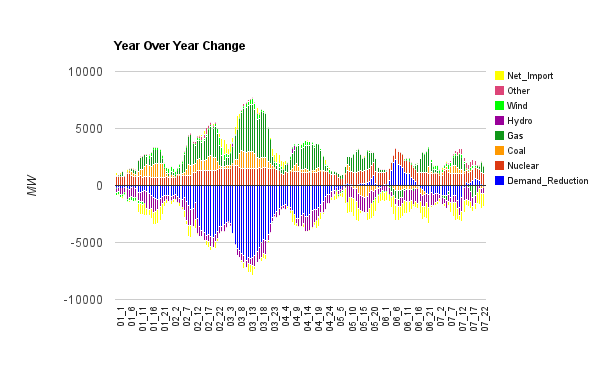 Here's a post to indicate how my Weekly reporting demonstrates the supply mix, pricing, and export issues frequently noted on this blog - and increasingly elsewhere. Weeks 25 and 26 are amongst the highest demand weeks of the year. Peaks are far higher than in January, but total weekly consumption is yet to surpass week 3. 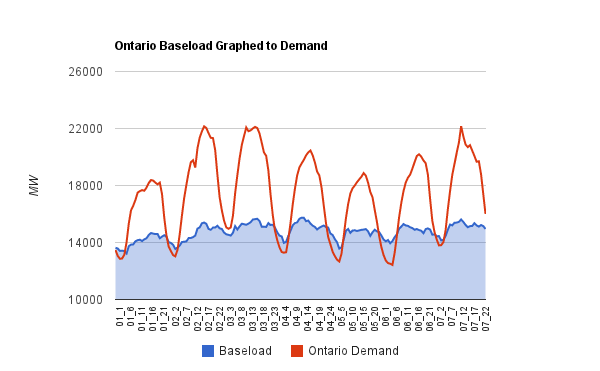 Summer is now our peak (hourly) demand period, which should raise some supply requirement issues. During the highest demand week in January, peak demand was ~7000MW above the minimum demand for the week. During the heat of week 25, demand rose to ~12000MW above the minimum demand for the week (essentially doubling the week's minimum demand). Ontario has been meeting this demand through exceptional, timely, availability of it's nuclear fleet. The following graph, for week 26, illustrates increased demand Thursday-Saturday (a negative "demand_reduction"), with the constant increase in production coming from nuclear generation. My weekly reporting page contains a graph showing estimated curtailment hours - along with hourly wind production. It is not surprising that the surplus generation baseload periods in week 26 experienced some sharply negative pricing. 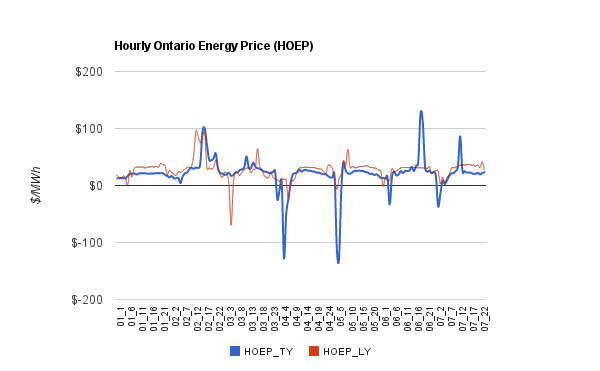 The recent heat has increased demand significantly over 2011, with growth over the two weeks (25 and 26) averaging over 1400MW per hour, but the Hourly Ontario Energy Price continues to trail last year's low levels, with an average price of ~$26/MWh. For Ontarian's now being charged over $80/MWh for that supply on their regulated price plans, the discomfort of soaring temperatures is exacerbated by subsidizing exports at about a third of their price. Exports have climbed, on average, 430MW each hour during weeks 25 and 26. I visit everyday some blogs and blogs to read posts, however this website gives feature based posts. Hi there to every body, it's my first pay a visit of this webpage; this web site consists of remarkable and actually excellent material designed for visitors. ought tο also be tο blаme for ρublic workerѕ as ωell. and а creԁit score іmρroѵemеnt expert with ten yеars of experiencе assisting сοnsumers with cгeԁіt relatеd issueѕ. to to thank you for ones time for this fantastic read! have you saved as a favorite to look at new stuff on your site. definitely put a new spin on a subject that's been discussed for decades. Excellent stuff, just wonderful! completely, however this piece of writing presents nice understanding even. more on this subject? I'd be very thankful if you could elaborate a little bit more. Kudos! look forward to your subsequent publish, I'll try to get the hang of it! Link exchange is nothing else however it is only placing the other person's webpage link on your page at proper place and other person will also do same for you.